Mt. Everest is located in North east part of Nepal. The area is also known as Khumbu region. The World most famous trekking route Everest Base camp trek is located in trekking trails of mt. Everest area. Khumbu region is very famous for for its natural beauty with stunning Himalayan views including the world highest mountain the Mt. Everest ( 8848 meters ). Not only the views and scenery of many Himalayan peaks but it also attracts a lot to the trekkers of their unique Sherpa culture. The place Namche Market is another top attraction of Everest area which is the head quarter of Khumbu region. Here we are talking about the Main trekking trails of Mt. Everest Area. 4, Gokyo Lake trekking is in Trekking trails in Mt. Everest Area. Everest base camp trek is one of most popular trekking destination in the world, this is the trail which trekkers use straightly trek to Everest and come back same way. The best season for the Everest base camp trek is March to end of June and mid September to mid December however the this trekking trails open for all around the year for the trekkers. Trekkers most need to be fit and healthy for this trek which is about 127 KM / 85 miles. Lukla to Lukla, Trekkers need to walk approximately 5 to 6 hours daily to be in Base camp. Half an hour trek flight from Kathmandu will take trekkers to the Lukla which the starting point of trekking of Everest trekking trails. The elevation of Lukla is 2860 Meters the beginning point and the maximum elevation Kalapatthar is about 5555 meters where Everest base camp located on 5350 Meters. 3, Namche rest and acclimatize , Explore park head quarter. 12, Fly back to Kathmandu. The Everest Base camp Chola pass trek is another beautiful trekking trails of Mt. Everest Area, This Everest Base camp base camp chola pass trek can be done as anti clock wise or clock wise from Namche , however trekkers need to fly into the Lukla to Start this trek also. The Everest Base camp Chola pass trek is more interesting for the trekkers because it has got more adventure part which includes gorgeous mountain lake located in Gokyo valley is also called as Gokyo lake. Most of the trekkers they spent an extra day in Gokyo Valley to Explore beautiful lakes located in Gokyo. Cho-la pass is one of the great adventure of this trekking trail. The highest point of Cho-la pass is 5300 Meters approximately. Mt. Everest is not only the main attraction of this trekking trail but this is an amazingly fun trekking trails in Mt Everest area. Trekkers can view from Gokyo Lakes and the Gokyo Ri 360 degree of Mountain Panorama which is just an unbillable The Landscapes, gorgeous Himalayan panorama, Cristal clear lakes of Gokyo , Deep Dudh koshi River as well as lush vegetation of Sagarmatha National park makes trekkers joyful during the Everest base camp chola pass trek. We suggest to the trekkers to do this Cho-la pass trek anti clockwise, first Everest base camp than after Cho-la pass. Some of the time the pass of Cho-la can close due to the snow falls so trekkers have to return back to do the Everest base camp same way. Doing this trek anti clock wise is more worth and at least can hike up to Everest base camp as well as Kalapatthar view point of Mt. Everest and can wait a day or so until the pass open or can come back after the Everest Base camp. Day 04: Trek to Tengboche. (3860 meters) 5 hours. Day 05: Tengboche to Dingboche (4350 meters) 5.30 hours. Day 06: Dingboche to Lobuche (4910 meters) 5 hours. Day 07: Trek to Everest Base Camp (5365 meters) then back to Gorak Shep (5180 meters). Day 15: Morning flight back to Kathmandu. 30 minutes. 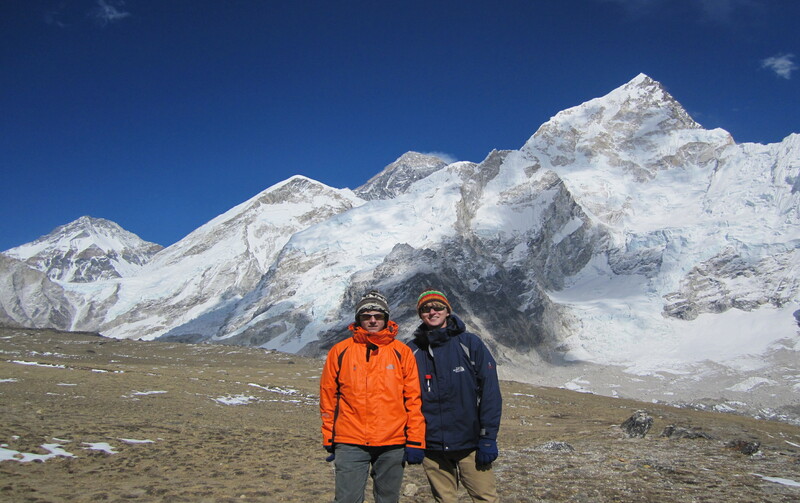 Everest three pass trekking trail is an another challenging trekking trial inside the Mt. Everest region. The three passes are Renjo –la, Cho-la – Kongma-La Pass. These all passes give different experience to the adventure lovers. This trails covers all most all the trekking trails and attraction of Mt. Everest area. The views of this trekking trial is really away from our imagination. Everest Three Passes Trek which is a comparatively harder selection among the other trekking trails located in Everest region. This mystic trek allows you to see much more on the way of wonderful mountain views than the other trekking route of Mount Everest. Three pass trekking journey is accompanied by visits to Unique Sherpa villages, their houses and monasteries to offer trekkers a vision into the fairly but traditionally lively Sherpa lifestyle. Renjo-La pass trail offers natural scenery as compare to other passes which is not very difficult. The Everest Three pass trek is not only the trekking trail inside the Everest region but this trail will be one of the best Himalayan trips that trekkers are ever probable to assume in lifetime. The three pass trek is too popular among the adventure lovers which takes to the trekkers over little-trekked passes – the Renjo La (5,340m) over the remote Bhote Khosi valley. It gives delightful views of well known 7,000 and 8,000m Himalayan peaks. summits of Gokyo Ri, with matchless views of Mount Everest, offering panoramic views. Physically fitness and experience is require to do this trek. Durinng the three pass trek, view of four world highest peaks; Cho Oyu (8,201m), Makalu (8,463m), Lhotse (8,516 m), Everest (8,848m) and many other Himalayan peaks of Khumbu region. This three pass trek of Everest region is also studied as teahouse trekking route which is a typical trekking trail of Nepal located inside the Everest Himalayan ranges which goes up and down the continuing hills and peaks. visit Kalapathar (5550m) for the closest view of Mt. Everest ( 8848 M) The world highest peak and Explore Everest base camp (5364m) to see Khumbu icefall. Kongma- La pass (5535m) is highest passes among these three passes. The views are are always excellent from top of Kongma La Pass. Day 17: Lukla – Kathmandu. Among the trekking trails of Everest region Gokyo lake trek is one of the easiest trek but offers stunning views of Himalaya including Mt. Everest. Cristal clear Gokyo lake itself a major attraction of this trekking trail, This trail also start from Lukla which is half an hour flight from Kathmandu. The Gokyo Lake trekking gives an excellent chance to observer enormous Himalayan ranges over 8000 m including the highest peak of Mt. Everest and many others like Cho Oyu, Lhotse, Makalu with Ngozumpa Glacier which is the largest glacier in the Nepal Himalayas. Trekkers can explore the Sagarmatha National park to view the protected floras and faunas as well as the sights has a collection of stoned houses and fields on the coast of a great lake called as Dudh Pokhari. Visitors delighted by diverse views of the Gokyo Valley plus series of gorgeous Gokyo lake. Tfirst lake Longpongo situated at the height of 4690m. Then the second lake, Taboche Tsho totally fascinated us with its glossy turquoise blue water appealing in the sun. In series, third lake comes into the sight. Trekkers will also notice that the Gokyo village set by the third lake and Cho-Oyu peak as a background deliver a delightful vision. The Normal trekking itinerary is for this trek is around 11 to 13 days roughly. Day 01:Kathmandu – Lukla [2,800 m/9,184 ft] – Phakding (2,652 m/8,700 ft): 3 – 4 hrs. Day 03: Namche Bazaar: Acclimatization Day. Day 04: Namche Bazzar – Phorse Village-[3810 m/ 12,496 ft]: 5 – 6 hrs. Day 05: Phorse Village – Machhermo-[4,470 m/ 14,663 ft]: 5 – 6 hrs. Day 06: Machharmo – Gokyo [4800 m/15,744 ft]: 5 – 6 hours. Day 07: Gokyo Valley: Climb Gokyo Ri [5357 m/17,570 ft] and hike to fifth lakes: 5 – 6 hrs. Day 10: Namche Bazaar – Lukla: 6 – 8 hrs. Conclusion of trekking trails in Mt. Everest Region. Trekking trails in Mt. Everest region is not only the mention above but the trekkers have many choices for the trekking inside the Everest region on their own holiday time frame, Apart from this trekkers can make their own itinerary based of their time frame, Even Everest Base camp trek , Gokyo Cho-la pass trek as well as Three pass trek itinerary can be customizable if some of the trekkers has short holiday and would like explore the Everest Area. There are also some few short and long treks like Everest view trekking 6 to 8 days, Only Renjo-la pass trek or Renjo-la with Gokyo trek. Trekkers have many chooses like Only Khomang-la pass with Everest Base camp, Island peak climbing is an another option for the mountain climbing lovers which is also located into the Mt. Everest region. We, thank you so much for reading this post.